Global competence is essential for responsible engagement in the world. Global peace and prosperity rest more than ever on mutual understanding and productive relationships among all nations and cultures. Our videos showcase how Title VI and Fulbright-Hays programs have contributed to a more positive image of Americans around the world and benefited a spectrum of professions and people whose work and lives have been enriched by foreign language skills and international knowledge. 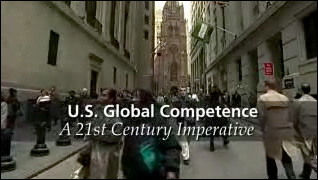 They demonstrate why U.S. global competence is essential in our interconnected world of the 21st century. Engaging the World chronicles the origins of HEA-Title VI and Fulbright-Hays programs 50 years ago, and showcases beneficiaries who are using foreign language skills and international knowledge in a variety of professions in ways that make a difference in their work, their lives and the world. They demonstrate the importance of global competence in a working world where diversity, global engagement and competition are the norm. A 21st Century Imperative makes the case that U.S. global competence in the 21st century is not a luxury, but a necessity. Whether engaging the world, or our culturally diverse homeland, the United States’ future success will rely on the global competence of our people. Global competence must become part of the core mission of education—from K-12 through graduate school. To watch the movies online, choose Small or Large (speed will depend on your internet connection). If you prefer to download the movie, please visit our movie download page where you will be provided with a zipped file. If you are interested in using either video at your company or organization, we encourage you to purchase the full-length DVD.